As I read through the list of my fellow nominees, my anxiety grew. 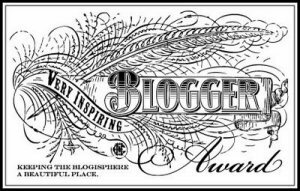 Not only had I been included in prestigious company, but many of the blogs that I admire and follow myself were recognized as well, thereby narrowing the field for my own nominations. Fellow nominee, Mimi of Waiting for the Karma Truck quickly revved her engine and fired off her acceptance speech, pulling yet *another* chunk of my favorites out of play with her nominations. My panic mounted–how to properly acquit myself and do justice to the award–that became my challenge. And time, obviously, is of the essence. So without further hesitation, I offer up my nominees…. Inga’s Angle: A wonderful photo journal of New York City. Inga has an unerring eye and always gives one a new perspective on the Big Apple. The Jolyn Project: This remarkable young woman again and again hits the mark–whether evoking a smile, laughter or tears, her posts never fail to move me. The Book of Alice: Alice, a.k.a. The Kidling, is one bright little light with observations that are by turns remarkable and risible; fortunately The Mama is on hand to capture the moments and provide ‘color commentary’ as needed. All of these delightful blogs (and so many others), bring inspiration, laughter, insight, knowledge and wonder to my world each day, as do each of you who follow this blog and take the time to ‘like’ and comment upon my posts. Thank you for sharing a bit of yourself with me. The rules for accepting this award and sharing the wealth may be found at The Thought Palette. They like me, they really, really like me! Thank you very much for deeming me worthy of this award, Maureen @ http://magnoliabeginnings.org/. Magnolia Beginnings is itself a wonderfully inspiring little corner of the web, and if you haven’t had occasion to mosy on by and check it out yet, I would strongly encourage you to rectify that immediately. Ya never know what little insight or spiritual boost you’ll come away with! Post the award image to your page: Check! Tell seven facts about yourself: Wow, this is tough (these sorts of lists are one of the primary reasons I’ve been procrastinating about my ‘acceptance speech’). That said, here goes…. I have always loved languages and have been blessed with a certain facility for same–as a kid, my heart’s desire was to be a translator at the U.N. (a desire viewed as decidedly bizarre by many inhabitants of the little Midwestern farming community where I grew up). I love working out and feel odd if I don’t head for the gym each morning. Charming Trinity: I adore the simplicity of this blog–each post features a triptych of photos based on a certain theme. I look forward to seeing what Daniela has posted each morning! Photo Botos: This blog boasts that it supplies viewers with “one spectacular image every day and the story behind it.” ‘Nuf said. The Book of Alice: Christine may well have the coolest Kidling on the planet–at the very least Alice is one of the most precocious I’ve encountered. You *never* know what is going to come out of this child’s mouth, but thankfully The Mama is there to capture it for us. Anake Goodall:Anake delivers a constantly inventive and provocative stream of images and videos. I am always delighted when I see a post from him in my in-box. Only Here Only Now: I’ve only recently begun following Tom’s blog, but it is AMAZING. You owe it to yourself to stop by…. Jane Balshaw: This blog was recently started by an incredibly talented friend–Jane is a textile artist, an aesthetician, and a *wise soul. * She has just begun her blogging journey, but I know it’s going to be a rich one…. Simon Marsh: Simon is an Anglican priest from England and, as they say at home, “a real piece of bread.” He’s kind and warm and wise and I always feel uplifted after reading one of his posts. Let them know they are nominated: Will take care of this momentarily! I was recently nominated for the “One Lovely Blog Award” by David Kanigan of “Lead.Learn.Live.” David’s was the first blog I followed when I entered this amazing world, and I continue to be startled by his ingenuity, insight and instinctive ability to post something incredibly helpful, heartening or humorous at *just* the moment it’s needed. If you are one of the lonely few who hasn’t discovered David’s little corner of the world, DO NOT wait any longer. You owe it to yourself. I can make a chocolate bar last for weeks–I like to eat one square at a time. I’m totally addicted to detective shows–‘Burn Notice,’ ‘Covert Affairs,’ ‘NCIS,’ ‘The Closer,’ ‘Major Crimes,’ — can’t get enough of them. I adore dogs and love reading about different breeds, their special traits, their genetic background, etc. For many years, I’ve owned big dogs–German Shepherds, Dobes, Labs–but I’m afraid of cats. Momentum of Joy: Joanna is an amazing, warm, inspiring individual and a lovely blogger indeed…. Kizzylee: Kizzylee’s blog is so refreshing–always heartfelt. Analyfe: Erin is a delightful young woman–intelligent, insightful and wise beyond her years. Let them know they are nominated: Will do! Thank you again, Maureen & David, for acknowledging my blog in this kind way and THANK YOU ALL for allowing me into your lives through this forum–it is truly a privilege….